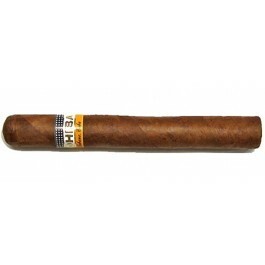 The Cohiba Siglo IV is a Cuban legend, a medium Corona Gorda, of 46 ring gauge, 5.6” (143mm) long and comes in aluminum tubes in a box of 15 cigars. Cohiba is without a doubt the Cuban expert at rolling cigars, they can produce cigars of all shapes, and yet again they deliver an outstanding puro. This one competes directly to the Punch Gorda’s, and aficionados of this vitola would be surprised with the Siglo IV. Seasoned aficionados and experts recognize the Siglo IV as one of the best Corona Gorda. It is a dense cigar full of various aromas. •	A powerful yet rich cigar. •	Typical Cuban woody aromas and a mixture of spices and sweet notes. It has a perfect size offering a lot of aromas without being aggressive. The Cohiba Siglo IV Tubos comes in 5 cardboard packs of 3 cigars in yellow aluminum tubes with Habanos packing code D-C-C/P-3-A/T-15. Honey notes combined with humid and floral spiciness. Perfect draw all the way, even burn and good amounts of smoke. Woody and tobacco notes set in with a lot of espresso aromas. Medium coffee bean flavors and also medium tobacco taste. Smooth and spicy cedar wood, fresh baked bread, chocolate and coffee flavor with a silky creamy aroma. In summary, a well-structured and a very well balanced cigar. Colossal yet rich and compact.